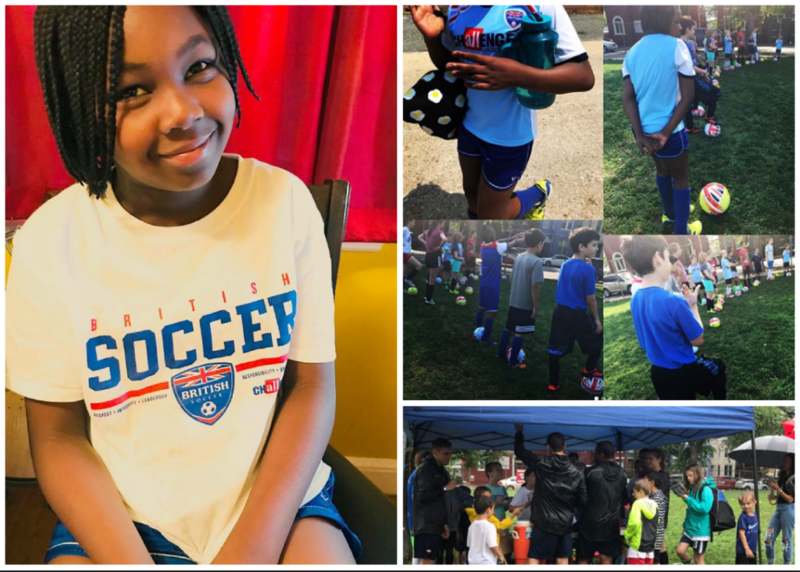 My daughter attended British Soccer Camp held on the field of a middle school on Capitol Hill in DC and had a great time making new friends, picking up some skills and enjoying the sport. As a bonus, her camp took place during the 2018 World Cup Soccer tournament. That's why I was excited about the opportunity from the camp for my little girl to attend the camp in exchange for this review. Each day, I'd drop her off and she got with her age group team, and was taught drills, skills, and new techniques. Her coach, Casio, was actually from Brazil but taught the camp with an Irish coach. For three hours daily Monday thru Friday, they taught two groups of about 10 kids in each group on the field. Each day, the coaches took the players through progressive series of skill building practices from unopposed, to opposed, game related and finally into a game. Soccer ABC – Players learned to limprove their Agility, Balance and Coordination. Dribbling – campers taught to improve the ability to change direction and move at speed. Moves – kids learned to master more than 20 different ways to turn and fake opponents. Passing – they learned to improve accuracy, pace and 1st touch control. Shooting – players also learned to improve power and placement with each foot. Tackling/Defending – the kids learned to improve their tackling skills and learn how to defend. She also came home with homework: to find and wear a specific team color the next day, to design a flag of one of the World Cup teams and to mimic the design of a World Cup Team (hers was Germany) on a white T-shirt. We had a great time designing the shirt together at home. Overall, she learned a lot and really enjoyed the experience. I could tell that she had picked up some new tricks and honed her skills some during the week. I'm glad she had an opportunity to attend and I will be sending her back next year, perhaps for the full day camp! For the most part, they had great weather though the last day it rained all day which put a damper on their finishing ceremony where they each got certificates. The kids were still very excited about wrapping up a great week. Consider signing up your kid for the remaining camps this year or next!